Welcome to this, the BIG ONE! Many of us are in the space of considering how best we fund for the education of our kids. Every few months we will see an article in a paper or an advert on TV or online which reminds us of the need to save for this 'big expense'. However at the end of each advert there is a product to be sold, which therefore casts doubt on what actually is or is not a viable option. In this episode we are going to share the main costs of education so you can begin planning, but importantly we will open your eyes as to 'how' to achieve the fund necessary to cover such costs! In Part 1 we will share illustrations to show you what might be involved in getting to your goals. As with everything on this blog I suggest starting with the end in mind; what is your goal, and then work backwards from there. So with regards to this topic you may consider how much you will need (even a ball-park figure) and determine when you will need it.In an ideal world would it be fair to say that you would like to have enough money as your kid starts 1st year to last the 3-5 years of college? In an ideal world that answer is often 'yes', so lets aim for that very outcome! For argument sake lets assume your children are 5 and 1 years of age. So when will you need the money? For child #1 (not to suggest that's your favourite!) you would need his/her college fund in 12 years, and for child #2 in 16 years. Seems like a long time away but it is best to start now, it's easier! The goal therefore is to have 1 college fund of €44,000 ready for Angel #1 in 12 years and to have college fund #2 ready for Angel #2 in 16 years. Hopefully I have explained that OK and the source of the figures makes sense? To make it more accurate I need to make it a tiny bit more complex here, sorry! 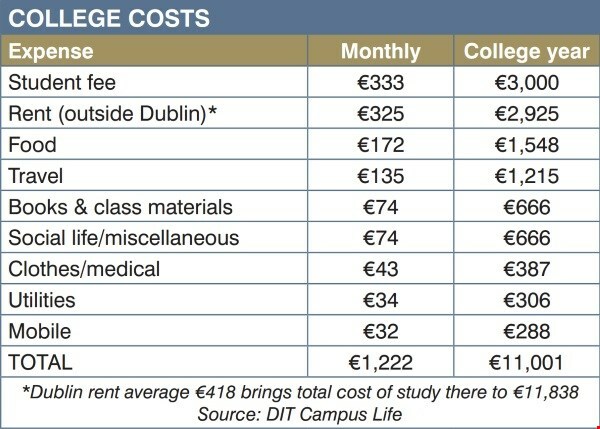 As of today €44,000 would cover the costs for 4 years of college expenses. However, as you know as time elapses the value of €1 diminishes, due to inflation (mostly). You may recall your parents or relations taking about their ability to buy a pint of stout or a vodka & tonic for 20p in 1970. Today 20p (€0.25) would get you a straw with which to drink that vodka & tonic! Inflation has a dramatic impact over medium and long period of time, so lets build that in to our calculations. Assuming an inflation rate of 2%, to have the purchasing power of €44,000 in 12 years time we need to aim for a future fund value of approx €55,000. Yikes! Alas, lets see how this might be achieved! So let's take the fund for Angel #1 as an example in regards how much one would need to save per month in order to reach the goal of €55,000 in 12 years time. Remember, we are aiming for a best case scenario, having the full fund ready for the 4 years on the 1st day of college. So, in this example if you saved €339 per month for the next 12 years, and you secured even 2% growth on your savings you would have the €55,000? Almost. See in order to actually get 2% Growth into your hand (Net), you need to achieve 3.3% Growth (Gross). The reason being that the tax on your Growth will be 40% of the Growth (depending on what type of savings scheme you have). Likewise if you were to save the €281 in this example you would need to achieve 5% Growth into your hand (Net), which means achieving over 8% Growth (Gross) on your savings, which is quite an ask! I would fear for your Well-Being if we were to delve into that particular nugget in this same Blog so we'll cover the 'how' of achieving the desired returns in Part 2! We will determine the pro's and con's of attempting to fund for this via Deposit, Life Company Products, State Savings or Purchasing Shares directly......big job for us next week!